Join us for UBC’s newest health and fitness program! Is health important to you? Are you curious about fitness? Join us for a new UBC Recreation program designed with YOU in mind. Move More, Learn More is a 6-week program that teaches you about physical activity and health, and gives you the knowledge, skills, and confidence to get active and improve your physical and mental wellbeing. 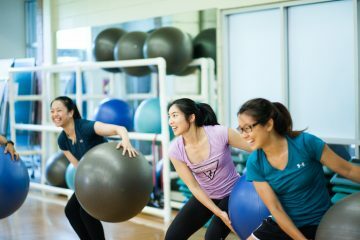 This targeted program is open to all self-identified female students, with a specific focus on catering to our Asian female student population – a group with (on average) low levels of physical activity. Move More, Learn More is designed for people starting out with health and fitness to try new exercises and see what fits your lifestyle. Take the first steps in 2019 towards a healthier lifestyle! Spread the word and bring your friends. No experience is required and no specialized equipment is necessary! Contact physical.activity@ubc.ca for more information. Registration has closed for the 2019 Winter Term, but check back for more details in July 2019!